Florida is one among the top five cities that have highest employment levels in the nursing occupation. In May 2013, the state employed 85,910 nursing assistants, as reported by the Bureau of Labor Statistics. The employment per 1000 jobs was 11.53. According to indeed.com, CNA in FL received an average salary of $23,000 (as on December 2014), which was 7% lower than average CNA salaries throughout the country. 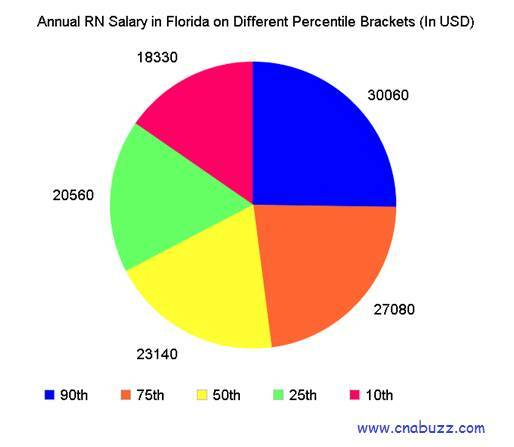 The mean annual and hourly CNA salary in Florida (as of May 2013) was $23,870 and $11.48, respectively. As a nursing assistant, you have opportunities to add to your income by working overtime. The table shown below gives a detailed view of the percentile wage estimated for CNAs on different brackets. 90% of certified nurse assistants earned less than $30,060; 10% earned more than $30,060. 75% of CNAs made less than $27,080; the remaining 25% made more than $27,080. 50% of the employees compensated less than $23,140; the rest of 50% compensated more than $23,140. 25% of CNAs received less than $20,560 wages annually; 75% were waged at more than $20,560. 10% of employees were offered less than $18,330; 90% were offered more than $18,330. It can be observed from the below given table that the maximum median annual salary ($25,785) was offered by Boca Raton, Fort Lauderdale and Hollywood, with median hourly salary of $12. Pensacola paid lowest to its CNAs. To earn better salary, CNAs must hold a higher designation, as it decides the salary and other related benefits. 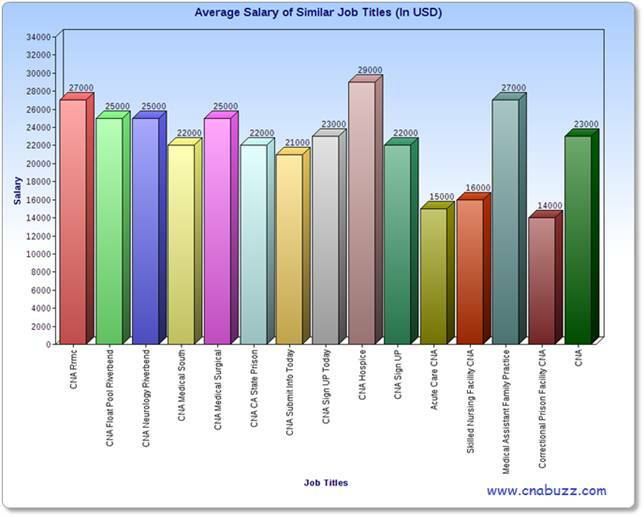 There is a range of different job titles in this profession with distinct salaries. For instance, in December 2014, CNA Hospice made an income of $29,000; CNA Rrmc and Medical Assistant Family Practice earned $27,000; CNA Float Pool Riverbend, CNA Neurology Riverbend and CNA Medical Surgical received $25,000. The pay of other professionals was reported to be in between $14,000 and $23,000. Family and Medical Leave: Under this benefit, eligible employees can take up to 3 months’ (90 days) unpaid leave for adoption, childbirth, foster care, etc. Certified nursing assistants often work in nursing homes, hospitals, retirement homes, rehabilitation centers, etc. According to the Bureau of Labor Statistics, it is estimated that CNA employment will rise by 21 percent in the upcoming years (by 2022). As the number of retirees is more in Florida, this mentioned percentage is likely to be even higher, especially in the Tampa city. Question 1 – I am a pre-nursing student, and I’ll be completing my certification by the end of this summer. As such, I don’t have any major bills to pay; I am required to pay my car bills $200 per month. Can anyone tell me the average salary of a CNA in the state? Answer – The average annual salary a CNA can expect is $23,000 (according to the statistics provided by indeed.com). Question 2 – Can anyone tell me the salary of a CNA in Tampa? Answer – There are a number of facilities that require you to work every other weekend. The salary completely depends on your work, knowledge and experience you have. However, you can expect $10-14 per hour.